I have been pushing myself to finish transcribing the notes I took during the Contemplative Practice and Rituals in Service to the Dying retreat with Roshi Joan Halifax and Frank Ostaseski, which I attended in early August at Upaya Zen Center. I didn’t used to bother transcribing notes I’d taking during Dharma teachings but then I read Dying with Confidence by Anyen Rinpoche. As I wrote in a previous blog, that book inspired me to type up my notes afterwards so that I can better internalize the teachings I’ve received. I wanted to record my impressions of the Upaya retreat while my memories were still strong and I had a better chance of interpreting my notoriously poor handwriting. I’m also leaving soon on another trip, which will bring many new experiences. Before my trip, I wanted to write at least one more blog inspired by the retreat. I have enough material in my notes to write many more blogs; this one I wanted to be about the actual focus of the retreat – being with death and dying. 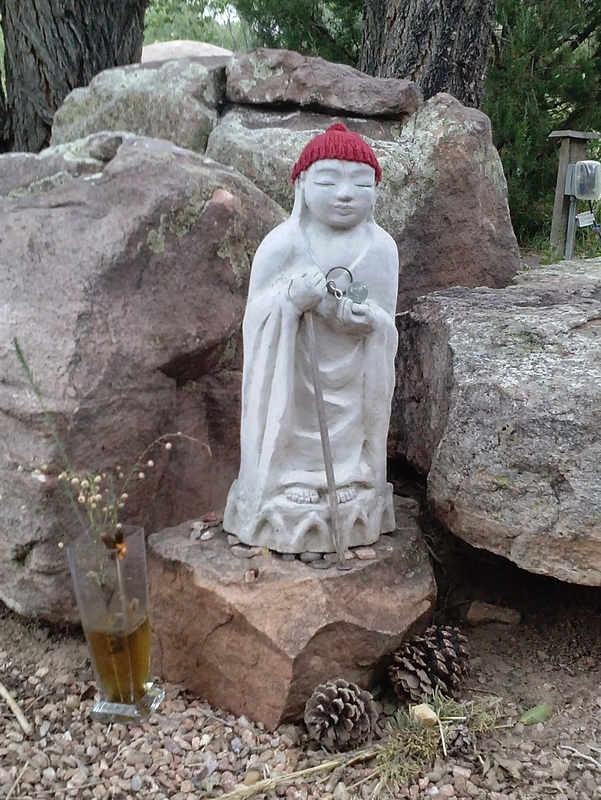 I knew I would accompany the blog with the photo I took of the Upaya garden statue of Jizo, one of my favorite bodhisattvas and the one most closely associated with the deceased. I’ll have to devote some future blog to Jizo. Writing about the death and dying teachings I received at the retreat has been very difficult, mainly because I’ve struggled to extract the teachings from the incredibly intimate environment in which they were given. Through the process of transcribing my notes, this blog emerged. 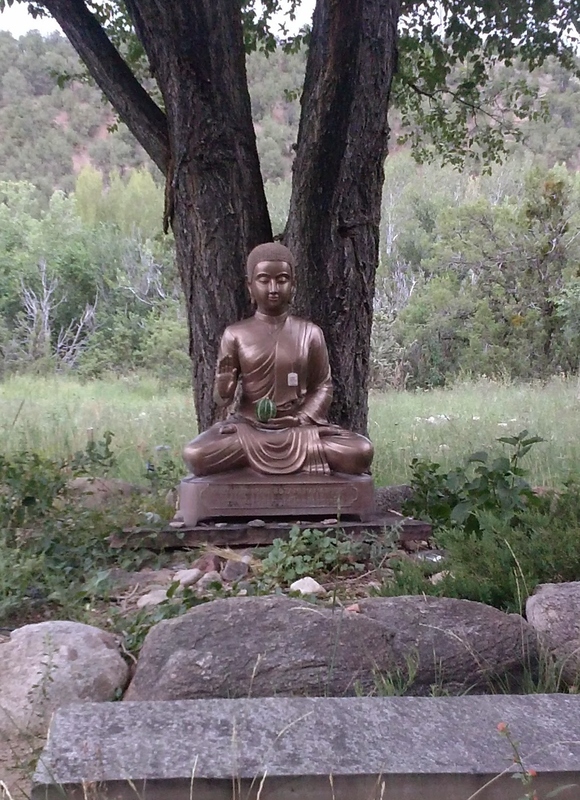 This is a photo of one of the lovely statues at Upaya Zen Center. The first few times I passed, I thought it was a Buddha statue. Then I sat down next to a fellow retreatant and really looked at the statue. A smile broke across my face as I read the inscription, Mahapajapati Gotami, and realized this was a statue of the historical Buddha’s maternal aunt. I’d never seen a statue of Mahapajapati before, but I know her story well; I retold it for children in a chapter of In the Garden of our Minds entitled The Value of Persistence: The Story of Mahaprajapati (I used the Sanskrit transliteration of her name, rather than the Pali). Most of my knowledge about her comes from the wonderful book The First Buddhist Women: Poems and Songs of Awakening by Susan Murcott, which provides historical and spiritual context to accompany translations of the first Buddhist women’s enlightenment verses. Mahapajapati raised the Buddha after his mother (her sister) died. When the prince was twenty-nine years old, he left home to seek enlightenment, leaving behind his wife Yasodhara and infant son, Rahula; Mahapajapati would have remained closely involved in their lives. When the Buddha eventually returned home, Mahapajapati welcomed him back and together with her husband (the Buddha’s father) converted to the Dharma. Many years later, after Mahapajapati’s husband had died and her son and grandson had both become monks, the Buddha came home to settle a violent water dispute. Many local men became monks as a result of the Buddha’s resolution of the conflict, leaving more women without husbands and sons in their homes. Mahapajapati asked the Buddha to ordain her and a large group of other women as the first Buddhist nuns. The Buddha refused her three times, finally departing with his entourage of monks to Vesali, a town about a hundred and fifty miles away. 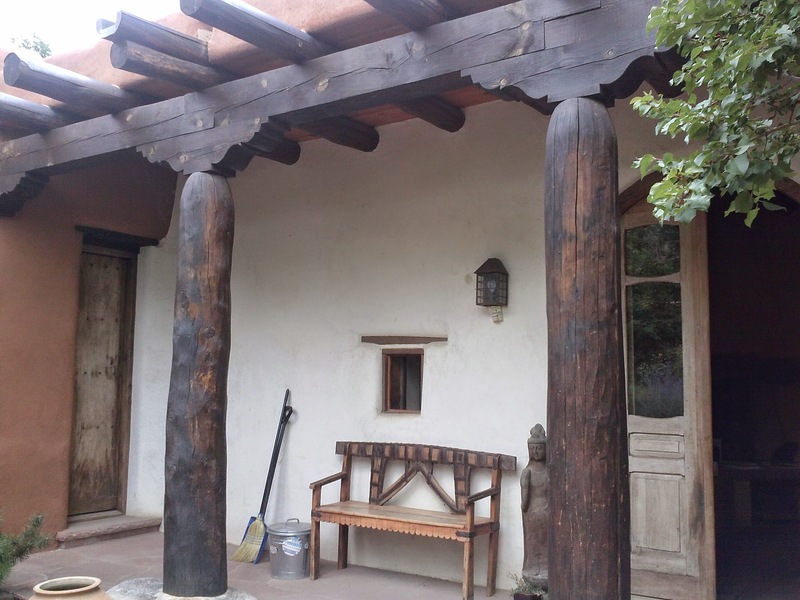 I am recently returned home from a vacation that included a three-night, four-day stay at the beautiful, peaceful Upaya Zen Center in Santa Fe, New Mexico, where I attended a retreat entitled “Contemplative Practice and Rituals in Service to the Dying”, taught by Roshi Joan Halifax and Frank Ostaseski. Perhaps I should say “facilitated” rather than “taught”, because there was nothing arm’s length about this retreat. There were more than fifty of us attending and I was one of the very few not actively working or volunteering in end-of-life care or who had not recently tended to the dying of a close loved one, often at home. Our time together consisted of meals, work practice, and multiple daily sessions of silent meditation and group discussion that left most of us emotionally (and surprisingly physically) exhausted. The retreat certainly fulfilled the advertised description of being “an intensive plunge into core contemplative practices”. Afterwards, the only way I could think of to describe how I felt was that my soul had been scrubbed clean.